I will try my best to do a good recap. So many details, memories and lessons learned. 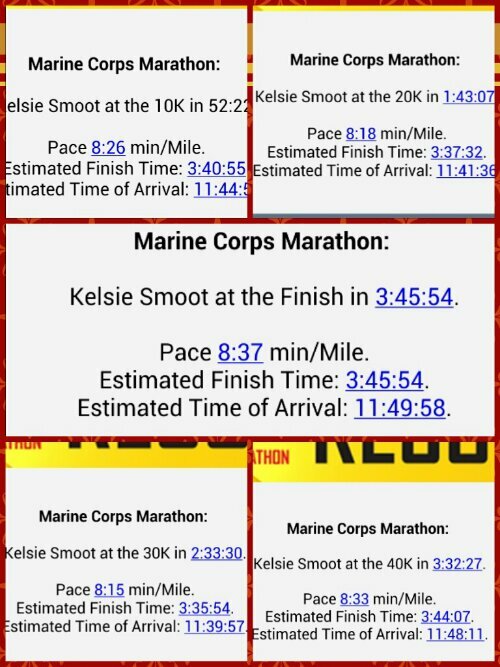 That’s why I broke this Marine Corps Marathon weekend down into smaller updates so bear with me on this one. Good thing I got 9 hours of rest on Friday night. Saturday night was nothing but tossing and turning. I didn’t get to lounge as much as I wanted due to the Expo delays. I was up at 2:00 a.m. The alarm was set for 4:30. My parents and I drove to Crystal City to catch the free shuttle. I thought that would be easier than taking the Metro. The shuttle was a smooth process. Drop off was not that far from the starting line. Porta potty line, UPS gear check and off to the starting line. Runners galore! 30,000 for the marathon and not sure how many for the 10k. I dropped my gear belt and broke the cap to one of my water bottles. Good job Kels. I’m pictured with my throw away clothes. There were piles of them at the start. This is my serious look. A lot of internal processing taking place. Wheelchair start and the runners are off! The first five or six miles were very crowded. We had to make holes for the wheelchairs to get through every once in a while. I held onto the broken water bottle for light sips. I needed that water to avoid the first few water/Gatorade stops. They remained crowed the entire course but the amazing Marines and volunteers made it a smooth hand off. This course was described as flat after the first 4 miles. I don’t know who made that up. The marathon I ran had inclines all over the place! This was physically challenging. With the inclines came some nice downhills. I was careful on those downhills because on one of my recent long runs I had some left hamstring problems. That hamstring haunted me the entire marathon. I heard someone say “Welcome to Georgetown!” The crowd support was so strong in this area. The small things spectators say which make a difference. Too bad some man decided to smoke a cigar. What was he thinking? My pace was looking good. I was concerned about my Garmin showing more distance than the course markers. I grabbed a 4 hour and 3:45 pace band from the Cliff Bar Expo Booth. The morning of the race I looked at the 9:09 pace for a 4 hour finish and knew I could do better. The 3:45 pace band was my saving grace. It kept me on target and made me feel good because I was 4 to 6 minutes ahead of pace for majority of the race. There were so many people that I did not see the 3:45 pacer at the start. Around mile 11 is when I caught up and passed them. I started to run with them but I knew I had 15 miles to go. I wanted to treat this as an all or nothing marathon, not a group long run. It was around this time when I took the last sip from the broken bottle and tossed it. It was a relief to run hands free. There was a long stretch of a Fallen Soldiers tribute with signs and flags. It was so sad to see the faces of these young men and women who had died in combat. Some of them had photos with their children. I saw several pre placed signs on the course. Some had goal times and cute slogans. My left earring fell out. Bummer. My Mama gave me dem Swarovski earrings! Half way mark. I ran a 1:44 half which was 12 minutes faster than my time for the KY Derby mini. All smiles but self doubt that I needed to double that distance and hold my pace. I held sub 8s from miles 6-12. I wasn’t trying to be rude. I was working and needed all my oxygen intake. He passed me. I passed him back and kept it that way. I’m not a big talker during runs especially when I get up in miles. Like I said, this wasn’t a training long run. Work it. Work it. I read somewhere to “Leave it all on the course.” My feet started hurting and I felt random aches. My body was going through some changes! I made it to mile 15. I glanced to my left and saw the MLK Memorial. Beautiful sight! The crowds for the next few miles around the National Mall were spectacular! One guy wore a carved pumpkin on his head. I was counting down the mileage. That gave me more fuel besides the constant stops I made for Gatorade and water. I gulped 2-3 cups at each stop and slowed to walk a few steps while doing so. I also grabbed a couple oranges. The salt disolved my lip gloss and the head wind made my lips dry enough to strike a match. These lovely ladies held vaseline on mini plastic spoons. I felt like Floyd Mayweather in between rounds. As early as mile 3, I would see runners dip off to the side while grabbing a body part (mainly legs) and drop out. The most heartbreaking was right by the U.S. Capitol. My pace dropped but I was still ahead of 3:45. I squeezed out a sub 8 at mile 17. The crowds gave me a rush. After mile 18, I was passing this guy and I noticed how his right leg looked wobbly. A second later, he shrieked in pain as he grabbed the back of his leg. His leg folded like a noodle and he went to the ground. A spectator yelled, “MEDDIC!” I didn’t look back. That made my stomach hurt. 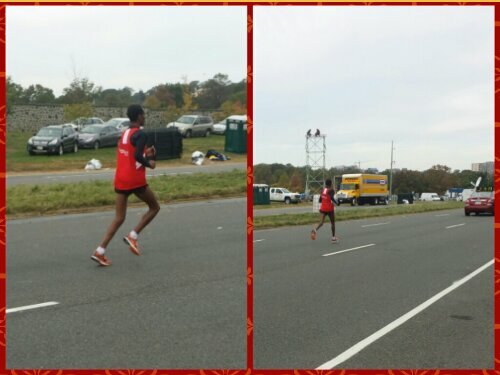 Around this time is when the first place winner, Girma Bedada cruised through with a time of 2:21:32. Capt. Kelly Calway brought ran 2:42:16 to earn first place in the women’s. Where the heck is the next mile marker? My body is hurting. I need more water. Oh, look at the pretty buildings Kelsie. Cute cop at 10 o’clock. Is he checking me out? How do I look? The crowds were still going strong. I gave a shout out to a support group from Black Girls Run! They always look good in their pink and black. I now I’m getting into the “heavy heavy” as my Spin Instructor would say. My quads were begging for mercy. Back was sore. Feet ACHING! Am I hitting a wall? It sure felt like it. I’ve never been so fatigued in my life! I knew quitting was not an option. I grew discouraged by seeing more and more people drop out. Please don’t let that be me. Crossing back to VA at miles 20-21 seemed like it took for-e-ver. This is what they mean by beat the bridge. Runners must maintain a 14min/mile pace in order to get pass this location so roads can reopen. The course took us through Crystal City. More love from the crowd. They were deep! I saw the 3:45 pacers. I ran with them for a mile. It hurt too bad. At this point the cow bells got on my nerves. I’m hoping I don’t get passed by the 4:00 group. Mile 24. The sun is beaming. I kept my gloves but I shed my homemade arm warmers. I cut the bottoms out of some cute pink and grey stripped Dollhouse knee socks. The heel part fit perfectly for my elbow. Kinda ghetto but the idea was to keep warm and shed as needed. It was better than wearing men’s tube socks as one writer suggested. Mile 25 to 26. Lord have mercy on me! So you think it’s only a mile. I know the exact distance from my front door to do a quick 1 mile-8 mile loop. It’s like some around the block type stuff. Oh no! Not when you have already ran 25 miles. That was the longest and the hardest mile I have ever ran in my life! I hear a lady call my name. I waved. Then I see my Dad and I waved at him. Glad he got to see me in action. Mom saw my text alerts but somehow missed me. The crowd was so ganged up. 385 yards. Tears form. This hill is way steeper than I had imagined. I start sobbing and made it to the finish. The crying did not stop for 15 minutes. It was one of those ugly cries too! I was in agonizing pain. I heard directions to keep straight for a finishers photo at the Iwo Jima Memorial or go to the left. As much as I love pictures I opted out. You know I was hurting. People asked me if I was OK. I wanted to fall down on the grass but I knew to keep moving. I felt slightly better with each step. I received a bag which was quickly filled with food. I must of looked hurt because they gave me 2 of everything. 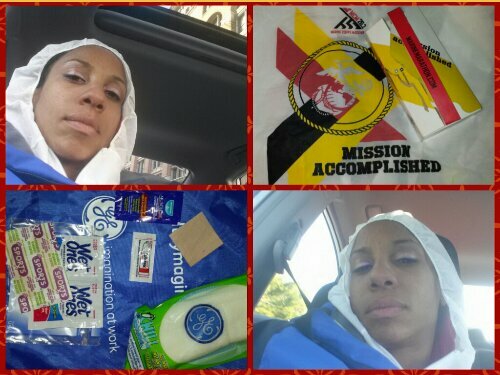 I was comforted with a nice hooded jacket and was medaled and saluted by a Marine. I saluted him back and thanked him. G.E. handed out bags with first aid items. Another group passed out watermelon in containers. I was so happy for that because it contains a high amount of electrolytes. Off too the family meet up. Back on the shuttle and safely home. Enough salt on my body to melt a driveway. Ain’t nothing glamorous about running a marathon. Lots of hard work and effort. Thank you to my family and friends who helped me reach my fundraising goal for the Prostate Cancer Foundation. I wore the wrist band the entire marathon. Thank you to my running group. This is only the beginning! Best of luck in Indy next week! Thank you to my Spin Instructor and fellow spinners. You all worked for the betterment of my first marathon completion. 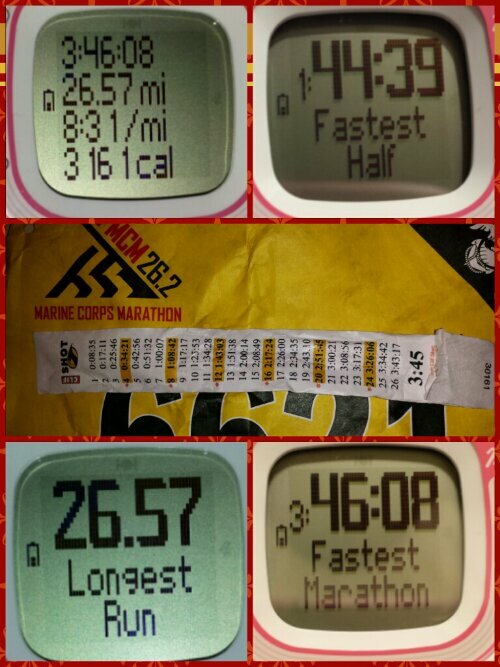 This entry was posted in D.C., marathon, running. Bookmark the permalink. You did and do great work! 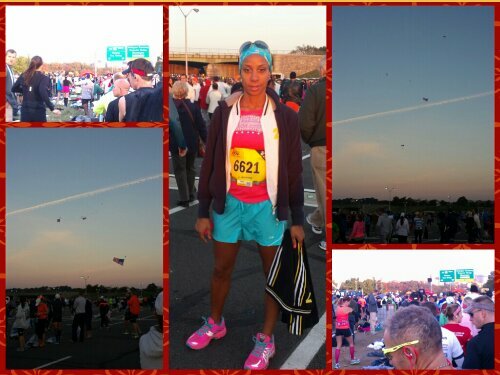 Loved your re-cap of the race and am awed and inspired by the effort and discipline it took you to get there. The longest race is the one you don’t finish, so congratulations for making it. On to the next one! Thank you! That made me smile. Yep. I’m on to the next one. On to the next one! Wow, great recap! Congrats on managing the hamstring, working through the pain & crushing that course. Sounds like an emotional journey on so many levels. Maybe MCM is one I should add to my list! Congrats! Way to win the battle! Thank you. Nursing my battle wounds! Fantabulous job! MCM is one of my favorites! Congrats! Sounds like an awesome race! Thank you! The atmosphere was amazing!